Steve Jobs road from working out of a garage with his friends to the introduction of the iPod in 2001 can also describe this movie. Long and tedious. While well acted and seemingly accurate, unless you're an Apple maniac, this movie may not be for you. Even if you're an Apple maniac, this movie may be nothing more than nostalgia to you. If does give you some insights to his early life which is interesting. You learn a lot about the man, his passion, which may make you like even more or quite the opposite. As you learn from the film, it's quite amazing how a man that builds and connects with the every day man can have so little connection to his employees and his friends. While the acting is top notch all around, special kudos for Ashton Kutcher in the lead role. From his features to his mannerism for his signature walk to hand movements, he looked the part and talk the part. In the beginning sequence with a flashback to the Apple Conference in 2001, you would've easily mistaken him for Jobs for the distance camera view. 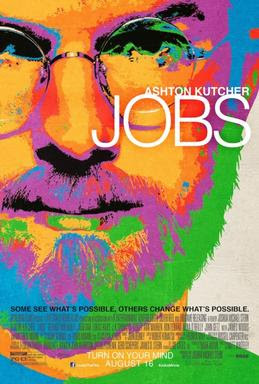 Overall, I would still recommend this film in theaters for fans of Steve Jobs and Apple. If you're not, it's worth a rental in the future. As I've said before the movie is a bit on the long side with certain scenes dragging out and not necessarily important to the overall plot. Such as scenes from Jobs trek to India and later on when he's gardening in his backyard. Instead I would've like the time to be spent more on his rivalry with Bill Gates and Microsoft as well as his relationship with his girlfriend/wife and other friends. Robert Pine as Edgar S. Woolard, Jr.
Don't you just hate Movie Spoilers?